A House committee has approved a bill that would ban four types of flame-retardant chemicals. Decades ago, firefighters were in favor of adding chemicals to furniture and other products that would make things burn more slowly. They now say those same chemicals are making firefighters sick. Firefighters point to scientific studies showing that, when burned, the chemicals produce carcinogens that can be absorbed through the skin. "Firefighting is a dangerous business, and we all accept that," said Chris Parsons, president of Minnesota Professional Fire Fighters. "But what we cannot accept and stand by for is the needless risk to our health from many of these flame retardants in use today." St. Paul fire Capt. Steve Shapira testified that he's always been healthy and has no family history of cancer, but 14 months ago was diagnosed with non-Hodgkin's lymphoma. The 17-year veteran said cancer wasn't even a consideration when he decided to become a firefighter. "When I started, we were concerned about heart attacks, burns and accidents of all types. Now those concerns have been dwarfed by cancer," he said. Researcher Susan Shaw traveled from the East Coast to testify in favor of the bill. Shaw, a public health professor at the State University of New York-Albany, shared statistics showing that the incidence of cancer among U.S. firefighters has increased over time. "Fires today are much more toxic than they have been in the past," she said. "That's because of the amount of synthetics and foam, furniture and plastics we have in the home, and also because of the chemical treatment of those products, so there's been a change, and the change is about chemicals — chemical use." 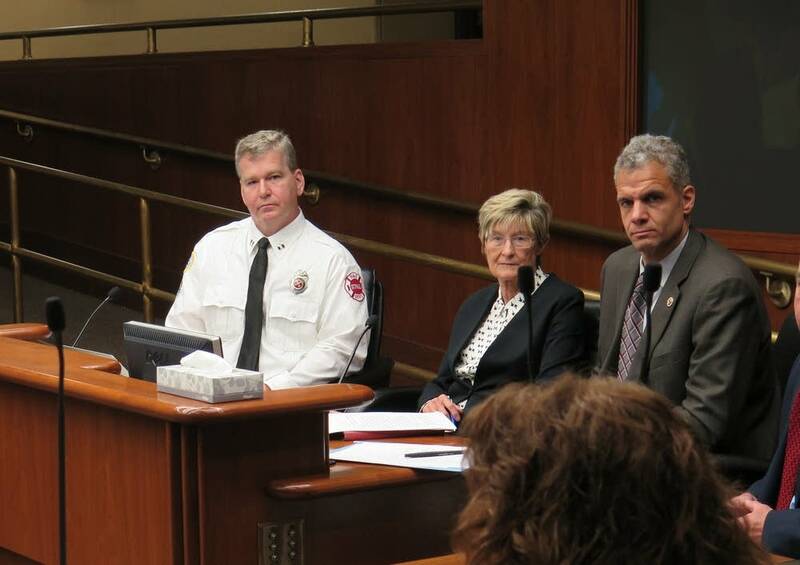 The Minnesota Senate last month passed a bill nearly unanimously that would ban 10 different flame retardant chemicals in a wide variety of products, including mattresses and carpeting. But following opposition from the Minnesota Chamber of Commerce and the American Chemistry Council, the House bill scaled down its version of the bill. The latest version would ban only four of the chemicals in furniture and children's products. Shaw said it's a missed opportunity. "I'm tremendously disappointed today that we don't have more of the chemicals on this list. I can't even believe it," she said. The American Chemistry Council, which represents companies that make the chemicals, attended the House Commerce Committee meeting to argue that flame retardants can save lives. Industry toxicologist Thomas Osimitz said he doesn't dispute the increased cancer rates among firefighters. But he said smoke contains plenty of carcinogens on its own. "It may be that they're exposed to more smoke and more byproducts from smoke regardless of whether flame retardants are present or not," he said. State Rep. Jeff Howe, R-Rockville, the bill's author, said he will push for a floor vote in these final days of the legislative session. Rather than negotiating a compromise with senators, the retired firefighter and fire marshal said he hopes the Senate will agree to the scaled back version of the bill.